WASHINGTON – As Peace Corps teachers head back to the classroom this fall, they join the ranks of more than 45,000 education volunteers who have served in 131 countries since 1961. There are currently approximately 3,000 Americans teaching as Peace Corps volunteers in 48 countries. Throughout the month of September, the Peace Corps is highlighting the work of education volunteers as part of a larger effort to promote the agency’s programs around the world and highlight the professional skills that volunteers bring back to American communities following their service. Volunteers work in elementary, secondary, and post-secondary schools, teaching math, science, and conversational English, and serve as resource teachers and teacher trainers. Education volunteers also develop libraries and technology resource centers. Last year alone, volunteers collaborated with their host country partners to create more than 1,000 libraries. Peace Corps teachers are expected to reach nearly 300,000 students in 2018. Many volunteers return from service to pursue careers in education across the United States. Earlier this year, returned Peace Corps volunteer Mandy Manning was named the 2018 National Teacher of the Year and honored during a ceremony at the White House. Manning, who taught in Armenia as a volunteer, now teaches English and math in Spokane, Wash., at Ferris High School’s Newcomer Center, which provides instruction for immigrant and refugee students. Peace Corps supports several initiatives aimed at helping currently serving and returned volunteers pursue careers in education. For example, education volunteers in 11 countries have the opportunity to participate in a Teaching English as a Foreign Language certificate program, allowing them to earn a recognized teaching credential during Peace Corps service. Through the Paul D. Coverdell fellows program, returned volunteers can receive financial assistance to pursue over 40 graduate programs in education and teaching. Participants also complete internships in underserved communities in the United States, allowing them to bring home, and expand upon, the skills they learned as volunteers. Last year, for the first time, the agency collaborated with D.C. Public Schools on a fellowship program that places multilingual, recently returned Peace Corps volunteers in schools around the District. The returned volunteers are assigned to World Language classrooms, which focus on seven target languages and are designed to prepare students for an increasingly connected and interdependent world. 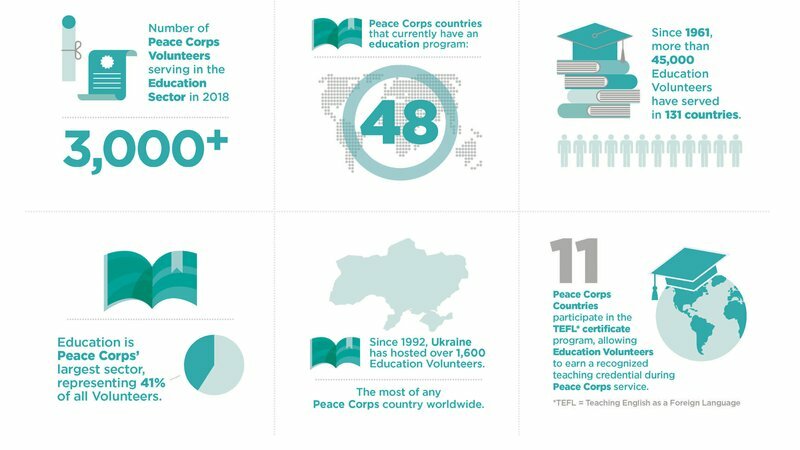 Educators in the United States can also connect with Peace Corps volunteers around the world through the Paul D. Coverdell World Wise Schools program, which is dedicated to promoting global learning through lesson plans, activities, and events based on Peace Corps volunteer experiences. Read stories from education volunteers here.